respect and a connection of minds I’d never experienced before." Click link below to read the whole blog post! If you don’t know Cheryl Morgan I highly recommend you get to know her. 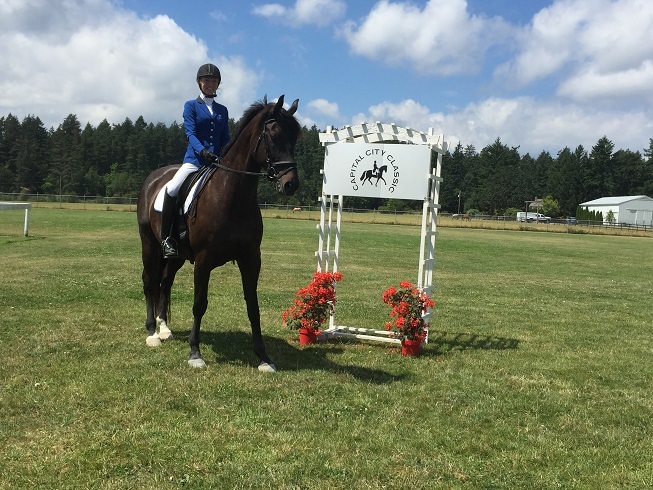 She is one very accomplished Dressage Rider, Dental Hygienist, Wife, Mother and Equine Massage Therapist. Quite frankly I don’t know how she does it all, but let’s go back to when it all started. Cheryl’s love of horses started when she was 11 on a swaybacked rescue pony that she leased in exchange for cleaning stalls. Fast forward a decade and she found herself riding an OTTB who had an extremely sore back. He exhibited all the signs of the classic “cold back” syndrome. She recalls, he was labelled as naughty, but she knew he wasn’t bad by nature. Her gut told her he was uncomfortable and in pain. Not giving up on him she researched online and found some sites on equine massage therapy. What she learned online she started applying to him. He started to improve; he became happy to jump and stopped bucking! Cheryl never said this but I am sure that particular OTTB helped her develop her now strong dressage seat. One thing I notice about Cheryl, when I see her ride, is her ability to always be sitting in the middle of her horse – no matter what her horse seems to be doing under her – but more on this later. All that research online led her to a certification program in Loveland, Colorado. Cheryl has now been practicing equine massage for 20 years and loving it! One of the most frequent issues she encounters in her practice is asymmetry in the horse’s top-lines. Bending from left to right is not always the same and tension is common through the poll, neck, shoulders, back and hindquarters. Cheryl goes on to explain this tension can cause compensation throughout the horse. The horse may start to take a shorter stride with one limb, they may become crocked or they may brace through their back. There are over 700 skeletal muscles in the horse and I get the impression Cheryl could name every one of them. I know for a fact Ferro would like each one massaged when Cheryl shows up for his appointment. It amazes me as she works her way over his body and points out areas where he is stiff or tight, he always confirms what she suspects by stretching his neck out or looking at the exact spot she is massaging. If he could talk I know he would be saying “Yes, right there! That is the spot!” For most horses the highlight of the massage session is the carrot stretch at the end. Cheryl is very good at ensuring the owners gain some knowledge as well during her visits. She gives you homework to do with your horse to keep up with the stretching and continuing to improve your horse’s flexibility. Over this past year, when Cheryl was not taking care of client’s horses she had the opportunity to work with a young dressage prospect named Faberge LS (Grace) owned by Christine and Sheryl Williams. Under Sheryl’s watchful eye, Grace and Cheryl blossomed into a spectacular partnership. It was only their first year out in the show ring together and they scored consistently in the 70s. Cheryl describes Grace as a big cuddly puppy that can turn on a dime – remember that strong dressage seat I mentioned earlier – well, Cheryl is right there in balance at all times. She never seems to get flustered or unseated giving young horses all the confidence they need to succeed. The highlight of the year for Cheryl was riding with Stephen Clarke. Cheryl looks forward to watching Grace debut at First Level as she hands the reins back over to Sheryl Williams. And if you are wondering where to find Cheryl when she is not massaging, riding or dental assisting – well that is easy, she would be having a glass of wine with her Bestie watching The Black Stallion. It is easy to get a hold of Cheryl, just email her at equineability23@gmail.com. Your horse will love ❤ you for it! So most successful people will tell you “when you want something in life you need to set your sights on it, really visualize your goal and make every step you take in the direction of that goal.” That is absolutely 100% true, however with the sport of Dressage it is also important to stop occasionally and look back. What the show season of 2017 has taught me among the obvious things such as “listen to your reader – it is really embarrassing to go off course when you have a test readerJ” and another good one is “the white dressage surrounds are there for a reason and you are supposed to ride within themJ” All fun aside and most importantly I have learned that it is necessary to stop and look back at how far you have come. It is so easy in Dressage to get caught up in thinking FORWARD. After all, we are always striving to ride forward – ride forward into the connection, ride forward into the transition. It is natural to always be thinking “what do I need to accomplish to get to the next level?” Instead of accomplishing one movement and moving on to the next I think everyone should stop and think back to the first show of the season and be so proud of themselves for where they are now. Since my lesson with Cesar Torrente, Ferro and I have attended 6 shows, performed 14 tests, including the wonderful Capital City Classic Show and ridden with Karen Pavicic. We have had high marks, we have had low marks, we have had much praise from the judges and clinicians and definitely lots of homework to work on. We even managed to get to a show, warm-up and perform our tests without a reader!! I feel like I can now keep my hands quiet, keep my lower leg even quieter, stay tall in my body and deep in my seat during transitions (which was a tough one with my jumper backgroundJ) All in all a very successful season making wonderful memories with my best friend. Many of you may not know the struggles Ferro has had over the years. There has, for some time now, seemed to be some niggling discomfort in his body that we could not treat. Recently, Dr. Parsons from Langley performed a neurological test on him and told me that he has some component of neurological disease. I have made the difficult decision to lay Ferro up for a year. Give his body a chance to rest and bring him back to work only when his body is right and he tells me he is not in any discomfort. Ferro is one of the kindest horses I have ever met and I want every chance for him to feel good in his body. Like everyone reading this blog, we all have special connections with our equine partners, situations or circumstances in our lives that give us that special bond, draw us a little closer and as those experiences add up day after day you find yourself looking at your equine partner thinking – he trusts me, he knows me better than I know myself, there is mutual respect between us. Once the relationship gets to that level I feel the only right decisions are the ones that put our special equine partners first. So, although I started this blog to bring together our wonderful horse community through Ferro’s and my travels I will now continue to blog to you all about Ferro’s journey resting and hopefully recovering. I plan to continue improving my dressage skills with a new equine partner and I know when the right one comes along you will all be the first to know! Now get out there and enjoy the last show of the season next weekend!! Don’t forget to look back if only to remind yourself how far you’ve come. Give your horse a big pat and a lot of treats for all the hard work you both have accomplished and look forward to the next level with a big smile on your face!! Cesar Torrente is an FEI 4* judge, Grand Prix rider and Corporate Lawyer by profession. Laura Hall of LH Equestrian Management did an incredible job organizing an Educate Your Eye Symposium with this gentleman. Cesar very quickly and accurately assessed my horse and I – we were going to be riding First Level Test 2. From the beginning of my session, I felt a warmth and generosity from Cesar – he really wanted to help me become a better rider and I knew I was going to leave that lesson a more educated dressage rider. I felt privileged to be learning from an international judge and competitor. The theme of my ride revolved around impulsion and engagement of the hindquarters. Ferro’s natural tendency is to be on the forehand, he has this incredible long neck and beautiful head that I tend to help him hold up. Cesar had me ask Ferro for more impulsion but at the same time I had to lighten my hands forward – all this right from the beginning of my ride. I needed to use more leg and seat and less hand. Tap him, Tap him, Tap him Cesar repeated. Then came all the transitions – trot – walk – trot – walk – trot – walk! As I trotted around the beautiful Fairlawn Equestrian Centre indoor ring I felt moments where I knew I had achieved what Cesar was looking for – my hands got light, I felt more suspension in Ferro’s trot and for that brief moment I felt like I could do anything J and then Cesar said with his lovely Columbian accent “OK – let’s look at the canter” I thought “EEEK!” I now had Ferro going with what felt like more vigor and enthusiasm in his trot then I was used to. I wondered to myself how he would react when I asked for that same response in the canter. Would he take it as an invitation to play and perhaps leave me lying in Fairlawn’s lovely soft footing? J Would I live to write this blog that I had offered to do for Victoria-Saanich Cadora? As I asked for the canter Cesar was already asking me to ask for more. The same drill at the canter, more transitions – trot – canter – trot – canter – trot – canter, then forward and backward within the canter, I have to learn to sit more and I definitely have to learn to let go of the inside rein! Through my whole session with Cesar I really felt he was helping Ferro and I become better partners. Cesar obviously cares about the horse and helped all us riders become more effective in order that our horses could happily perform what we were asking without unnecessary interference from us. I liked how open he was with the Hunter Jumper riders. Cesar felt all hunter jumper coaches need to work with students who want to do dressage because it really improves their jumping! The opportunity to ride with this fun and knowledgeable judge at a reasonable cost and at a beautiful facility was fantastic. I hope we can repeat it again. What came across for me was Cesar`s love for horses and passion for teaching. It seemed like he rode every step of my lesson with me which I found inspiring. I appreciated how invested he was in each and every session that I watched to improve both horse and rider fairly and correctly using the scale of training. As I sit here writing and reflecting on the symposium I think I can confidently say that we all hope to get more educational opportunities like this in our area. After all, Education is not the filling of a pail, but the lighting of a fire – William Butler Yeats and I feel so inspired to improve myself as a dressage rider, improve my horse and get out there and practice, practice, practice. Thank you Cesar for lighting us all on fire!